Abanding your car and choosing to do 100% of your travels by bicycle does wonders for your health, but not the health of your car (see photo). 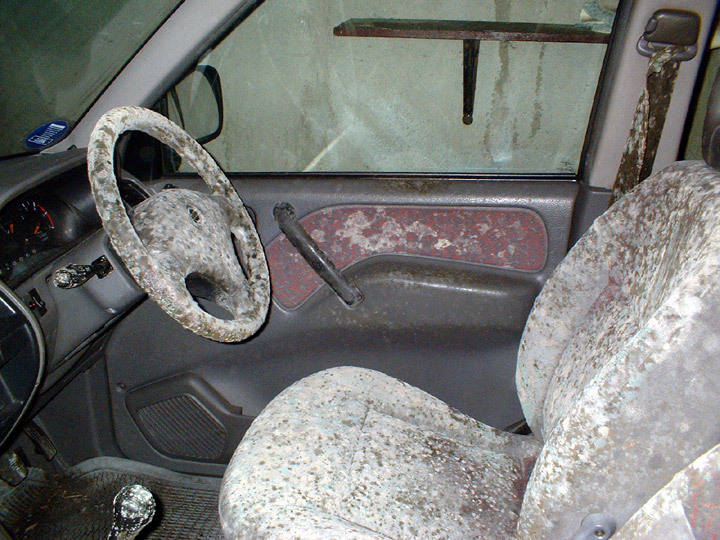 Back in December, when my car had been sitting in the driveway for a few months, I peered inside one day and noticed a few spots of mould growing on the seats and steering wheel. I promptly cleaned them off. During winter, I thought I would do the sensible thing and put my car away from the elements in the garage. I even put a few of those little silica gel packets along the dash to help prevent dampness. And I left it for three months. A few days ago, when I decided to bring the car back out into the sunlight, this is the present Father Time left me. Mould. Lots and lotsa mould. Amazing what the lack of human companionship will do to a car. Well, when the apocalypse strikes and wipes out 99% of the human population, you won’t find me hotwiring many cars on my travels. Yeuch! Mad Max never had to put up with this. Anyone want to buy a 1995 Nissan Terrano, real cheap? Actual vehicle featured in the famous Irish horror films Dark Light and Saul’s Pupils? No? … Oh. This got me thinking about all the times I’ve fallen off bicycles in the past. There’s so much I have forgotten from my childhood, but I think I can remember every single crash; trauma is funny that way. For your amusement, here are some of the funnier moments (well, they’re funny now). I was about nine years old, and my bike was the Raleigh Grifter. Who remembers those cool motobike-style handgrips with the twist action for changing gears? Asthetically, the Grifter was the predecessor to the BMX. But looks are where the resemblance ends. This was one heavy bike. Even though I was well aware of the limitations of this cumbersome beast, that didn’t stop me trying to show off to a couple of girls. There was a playpark near my house, with swings, climbing frames, and a big circular sandpit about thirty feet wide. The surface of the sand was at a depth of about two feet below ground level. While the girls were chatting on the monkeybars, I decided to ride my bike into the sandpit. I had done the leap successfully before. All you had to do was put the Grifter into a slight wheelie when you reached the edge of the pit. Despite the weight of the bike, this was doable … some of the time. This time, the bike went into a dive and threw me over the bars. I still remember the thud of my chest hitting the sand. As I got up and dusted myself off, I could hear giggling coming from the direction of the monkeybars. I picked up the bike and left the pit in defeat, feeling all my self-respect evaporating through my burning cheeks. As a kid, I was never one for bike mantenance, and I had that old Grifter for many years. One day, it let me down big-time. I was cycling from the road onto the footpath at the entrance to the housing estate where I lived. As my back tyre bumped the kerb, the entire bike seemed to split into two or three pieces. It literally fell apart under me. At least, that’s the way I remembered it. It wouldn’t have been so bad, except there was a bunch of teenagers enjoying an afternoon booze-up on a nearby lawn. How they laughed at me! How they mocked me! The worst thing was I couldn’t just walk away. Somehow I had to get my bike home. So I half carried and half dragged the remains of my Grifter along the footpath, forced to move at a snail’s pace, enduring a continual verbal barrage for many minutes until I was finally out of sight. When I was about eleven, the BMX craze was just beginning, and I became the proud owner of a Raleigh Ultra Burner. Since the bike was lightweight, I naturally tried to do various stunts on it. I don’t remember how many seats I broke, abusing that bike. My least fond memory is of doing a short race with friends down a housing estate. My brakes weren’t functioning at the time, and I should have known it was foolish to race with no brakes. Especially when there’s a big house facing you at the end of the road. By the time the house was looming I realised it was too late to stop, or even to turn. There was no garden at this house. Nothing but a footpath running perpendicular to my approach. For a moment, I had the crazy notion that if I held the front of the bike to the ground, the impact on the kerb would propel me over the handlebars, so that I would land on the footpath instead of crashing into the wall. It didn’t work (and maybe that was a good thing). My momentum was too great, probably around twenty miles per hour. The bike continued onto the footpath; the front wheel struck the house; the bike went into an “endo” (one of my favourite stunts in more controlled circumstances); my jaw struck the wall hard. Finally at rest, I reached up to touch my jaw. It felt numb. My fingers came away covered in blood and small white pebble-like things. My teeth! I thought. Thankfully, it turned out to be nothing more than the pebble-dash from the wall. Pebble-dash is pretty resilient stuff. You get an idea how great this impact was when I end up with the pebbles sticking to my face instead of the house. The scars from the accident aren’t too noticeable. It just bugs me now that I’m into beards, because there’s a little piece of my jaw where hair will no longer grow, right where the moustache joins the beard on my right hand side. There were many more accidents. I remember our labrador knocking me off the bike. Another occasion, my foot slipped off a pedal when I was pumping hard, resulting in me sliding down the road on my back with the bike wrapped around me; my sweater was shredded. I remember losing control of my BMX in mid-air whilst jumping. I remember trying to cycle down a steep ice-coated road, and I ended up “skiing” the whole way down on two wheels and one foot, like some ridiculous tripod. I remember doing a massive arc of a skid, when the bike suddenly found grip again and flipped me off itself. I remember colliding with another cyclist around a blind corner and wrecking his brand-new bike. Amazingly, I’ve never broken a bone. On the one hand, there are all these bicycle accidents. On the other, I’ve never had a car accident. Wonder what will happen if I buy a motorcycle? The speed of a car combined with the flimsy protection of a bicycle. Not a great combination. But still, I might get one anyway. Let me tell you the true story of the videogame I purchased that took three months to arrive. As I’ve done countless times before, I got the winning bid on an eBay auction from a seller who had 100% positive feedback (I always check), this time for a copy of Crackdown for the Xbox 360, a game I was looking forward to playing. Unfortunately the seller did not accept Paypal payments. No big deal, except I would probably have to wait a week or more for delivery due to the cheque having to clear. Two weeks went by, and there was no sign of the game. I emailed the seller and got a positive response. I did some more waiting. Still no game. I emailed again. This time no response. Well over a month later, I rechecked the seller’s feedback rating and saw that three negative comments had appeared. So, I wasn’t the only person this guy had decided to rip off. Well, either that or he had died. Who could tell? Anyway, I added my own negative comment to the others. Fair’s fair; he cashed my cheque and walked away without sending the goods. And if he’s now in heaven, he’ll hardly mind an extra stain on his eBay account. Next, I registered a complaint with eBay. Nothing happened except the seller’s account was shut down. So I had to decide: do I take this further or put it down to experience? Well, this wasn’t the first time I had been ripped off on eBay; it was the third. So I thought, No more. This time I’m not letting it rest. eBay had turned out to be prettty unsupportive, so I formulated my own plan. First, I used Google to locate the nearest police station to the seller’s address. Then I used eBay’s “Contact Member” form to write a message to the three other victims of the seller. I asked each of them to compose a letter addressed to the police in the seller’s area, detailing exactly what the seller had done, including as much detail as possible, right down to the cheque numbers and dates cleared. Instead of having the buyers forward their letters individually to the police, I asked them to mail them to me. Two of them did so. Along with myself, that made us a party of three. I then forwarded all three letters directly to the police in the seller’s area. This whole approach saved several different police stations having to forward and collate (and possibly misplace or ignore) the data. Instead, I provided them with a nice tidy all-inclusive package. I was prepared to leave nothing to chance. Sure enough, I eventually received a call from a police sergeant. He advised me there were two ways he could play it. He could either have us fill out an official form of complaint, or he could simply call round to the seller’s house today and quiz him. Collectively, we all agreed to the latter, because it was simple and quick. Boy oh boy, I would have loved to have seen the seller’s face when the sergeant arrived at his door and told him why he was there. Little did the scoundrel know that there were three offended customers from different parts of the country secretly conspiring against him. Yes, the seller was very much alive, and quick to make his excuses. His story was that shortly after the auction he had been admitted to hospital for three weeks, during which time he also had problems with his girlfriend. And it was the girlfriend who was the actual owner of the eBay account he was using to trade. He was actually able to show the sergeant the very games he had listed on eBay and he then agreed to post them the next day. The presence of the games indicates that there actually was some original intent to make good on the sales, and I’m willing to believe that the seller’s story would check out, if investigated. However, the excuses are rather feeble when you consider how I had been waiting three months for the game. I think it was more theft by laziness than theft by intent. But theft is theft, and if I had never brought the matter to the police, I doubt that I would ever have received the game. Crackdown finally arrived yesterday. There you have it. Honourable eBay users take note: if someone rips you off, now you know how to bring him down! "These aren’t the droids you’re looking for"
The product is called the Giraffe, and if that’s not hilarious enough, it’s made by a company called HeadThere. But for me, the real amusement is in imagining myself sneaking up behind it and toppling it over face-first while it’s trunding along, then watching the real boss storming into the office later demanding that the culpit owns up. Better yet, throwing a bag over its head and watching it walk into the walls. Oh, what fun the workplace of the future may be! I’d love to see what a pet dog would make of this metallic monster advancing on it with Master’s face and voice. Or how about the reaction of a young child to a virtual Daddy? Oh, it’s true; I’m a wicked, wicked man. Confessions of a computer rage sufferer and other "accidents"
Take a larger look at the image on the right (from a MakeZine post). See that inset picture of water being poured over an Atari 2600 console? My, oh my, how that brings back memories. I was ten years old at the time, sitting alone in the living room, waggling my joystick (before comments ensue, did you hear me say ten? ), when suddenly a wasp flew into the room and disturbed my happiness. I quickly grabbed the TV guide and rolled it up into a tube, ready to do battle. The wasp landed on my Atari 2600 woodgrain console. I seized my chance. Slap! Wasp-guts on my pretty games machine. So, I went into the kitchen, got a damp cloth, and proceeded to wipe old waspy’s corpse away. Then I took a closer look at the ribbed plastic section on the top of the console. It had always appeared solid, but if you looked at an acute angle you could see a circular air vent. Oh dear. Better switch it on quick and make sure it’s still working. Big mistake. My ten-year-old brain didn’t know that if I had waited until the console dried out, it would have been fine. As it was, my precious Atari was dead, killed by my hand as soon as I flicked the on switch. Of course, that wasn’t the only electronic mishap I’ve had. When computers are a big part of your life, it’s unavoidable. Actually, some of what I’m about to tell was avoidable, if only I’d had more sense. The next mishap I remember was Christmas Day, when I was fifteen. I’d been given a shiny new Sinclair ZX Spectrum +3 computer. I quickly attached a tape recorder to it, so that I could load my games (as you did in those days). But the games wouldn’t load. After a bit, I got a little miffed and wiggled the connecting lead in the socket. It seemed way too loose. I’d like to think it was that way straight out of the box, but I have to confess it’s more likely that I broke it. Man, that Christmas Day really sucked! I don’t recall anything bad happening for a long time after that, not until I started my job as ICT technician, aged 27. Now I’m about to talk about The Curse of the Trailing Lead, which has no doubt caught many a person. I wasn’t in the job more than a few weeks when I was setting up the internet connection. I had the router (a couple of hundred pounds worth of kit) sitting up on the desk with its lead trailing across the floor. At one point I stepped away from the desk, and the router decided to come with me; it had little choice, since its lead was around my ankle. Crash! My eyes almost popped out of their socket, because I was now looking at bare circuitry on the floor. The casing had split open and spilled the router’s guts. I panicked. How am I going to tell this to my boss when I’ve only worked here for a few weeks? Calmly, I put the router back together again. And you know what? I worked a treat! I got off lucky. You’d think I would have learned my lesson: Don’t leave trailing cables. Well, I did learn my lesson. The trouble is, not every member of staff in the school has learned it. One day, several years later, I happened to be in the art room. There was a laptop on the teacher’s desk with its power lead running across the floor to the wall socket. Well, when I went to leave the room, the laptop decided to go walkies with me. Crash! Unbeliebably, aside from one small crack on the screen’s hinge, the laptop survived. Sadly my luck would run out. Ah heck, what am I saying? My next mishap had nothing to do with luck; it was all my fault. I was using a school laptop at home. Unfortunately, there was an existing problem with one of the mouse-buttons below the touchpad: it would refuse to work intermittently. One day, I was in the middle of something important, and the button’s erratic behaviour riled me so much that I slapped the touchpad – quite hard. The noise that ensued sounded something like shhhhhh-click, shhhhhh-click. It was the sound of hard drive death. My heart sank. I thought, How do I get out of this without telling my boss? Aside from the shame of admitting I had done something like that, I didn’t want him suspecting me of vandalism every time a piece of equipment failed for legitimate reasons. And I’m just not the sort of guy who can tell an outright lie, such as, “Hey, my hard drive’s busted. Can we order a new one?” Anyway, I opened up the laptop. Lo and behold, the hard drive was mounted directly below the touchpad. I scoured eBay for the same model and size, and I found one. Phew! £50 got me the replacement hard drive, and all was well once again. A costly mistake. There are times when I’d love to get away from IT and be a postman or something. I love walking, and for many years I’ve had the unusual custom of going walking at night. There’s nothing creepy or vampiric in this habit; I just love the solutide and the absense of traffic noise. Nothing but me and my MP3 player. Usually I’ll head outdoors for an hour around 10.00 p.m., but occasionally as late as 11.00. Of course, night-time being what night-time is, you occasionally have an encounter that you wouldn’t normally experience in the daylight hours … like last night. I proceeded to lift the first bin up onto its base. As I reached the second bin, I bent down and lifted it, too. Likewise with the third. Why? Because I care about the neighbourhood and because I don’t want to be spineless (which is what modern society teaches you to be). By this stage, one of the guys saw what I was doing and started getting sarcastic: “Those wee rascals! The youth of today – what’s the world coming to?” That kind of stuff. I have a rule when someone tries to pick a fight with me (which doesn’t happen very often): I don’t engage and I don’t run. The reason I don’t engage is because I’ve never been a fighter (i.e. I have no practice and might end up hurt, or worse, humiliated). And the reason I don’t run is because I won’t be seen as a coward. However, I’ve made one exception to that rule. Once, I was out jogging (at night, of course), when some teenage guy I recognised came staggering along the street, singing his heart out. I remembered him as one of the kids I had gotten to know slightly a few years earlier, when I used to bring the Gospel to the neighbourhood (that’s another story!). He had always been a brat, poking fun at me as a Bible-carrying weirdo. But on that night, when he spotted me, he spoke to me with the kind of honesty that only drink can bring out in a person: “F*cking Christians! I’ll kill you! I’ll slit your throat!” (The Gospel was always like water off a duck’s back to this guy, but you’ve got to wonder what kind of an effect the Word of God is really having on a person, when they come out with words like these.) Anyway, when I encountered this guy, I was already running. So, heck, it didn’t seem like cowardice to keep on running. Last night I dreamed that Andrew Harrison and I were in the middle of making our next film, Shadow of the Dead. We were round the back of Portadown College, filming a scene with a girl (no, it’s not that kind of dream, you dirt-bird). I can’t remember the scene, exactly, and it didn’t resemble anything close to the story we have in mind, but I remember thinking that the scene would have been so much better if the character I was playing had his arm cut off for the rest of the film. Obviously this would be impossible on the cheapo budget of a Midnight Pictures flick, so we needed another solution. I had the crazy idea that if I allowed my arm to be chopped off for real, the doctors could sew it back on in a few months time, when filming was completed. I wondered whether I would lose any dexterity in the arm afterwards, and even if I did, I thought it might be worth the loss, for the sheer joy of improving the film. For some reason, I wasn’t thinking about the physical pain involved in losing a limb. The dream ended before I had to make the decision. I hate dreams where you’re not quite yourself. But still, there’s dedication for you! It began earlier in the weekend, with me noticing the toilet filling up dangerously close to the rim every time I flushed it. So, I checked the two manholes out back. The one farthest from the house was clean as a whistle. But as for the one that peeks out from under the kitchen extension, oh my! A phrase from the Vincent Price voiceover on Michael Jackson’s “Thriller” came to mind: “The funk of forty thousand years.” Or more correctly, half a metre squared of old human excrement (mine was still up the submerged pipe, somewhere inside the house). Suddenly the bad smells in the bathroom all made sense. My uncle came to the rescue with these big rubber poles that you can screw onto one another. We put about twenty feet up the pipe and shoved and shoved, with the power hose going, all the while running the taps to try and soften everything up into chocolate milkshake. My aunt had to walk to the other side of the garden at one point, the stench was so bad. After about half and hour, the stuff started to come through, and lo and behold, a thick plastic bag arrived out of the pipe. What kind of moron would ever shove such a thing down the loo? I’d say there was at least half a year’s worth of crap built up before I took over. The worst part was when the level went down far enough for you to see the pipe, then all my lighter coloured fresher poo came flying out, along with wads of toilet paper that threatened to block everything again. I had to reach in and scoop a load of this out before it went underground again. Oh, what a day! Anyhow, it’s all over now, and I was never so glad to get a shower. At least now I know for sure where the sewage goes, and I didn’t even need to get into the crawlspace. You didn’t want to know any of that, did you? But you have to admit, it is pretty funny.